After graduating from university, I was lucky enough to land a job with a local games company. I have fond memories of those days, mostly because we got a whole hour for lunch. Few of us actually ate lunch during that hour, because games were permitted on the LAN. 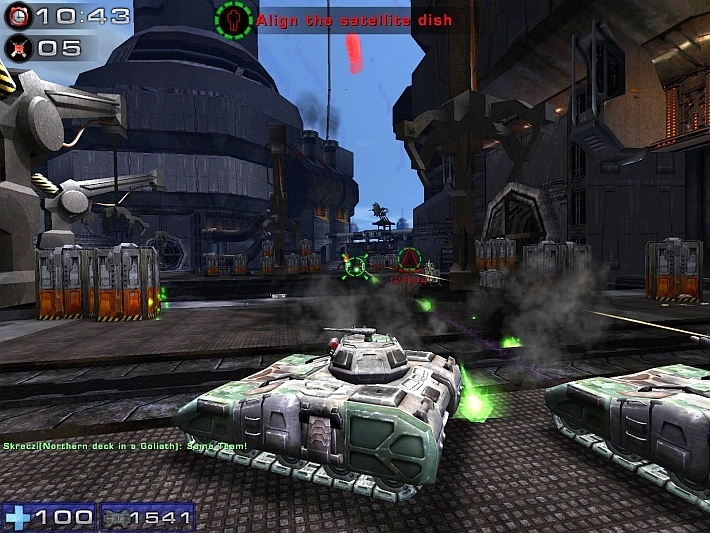 While all sorts of games were tried, my favourite was always Unreal Tournament 2004. Featuring a great range of weapons, vehicles and game modes, UT is, for many of us, the pinnacle of competitive first person shooter games. 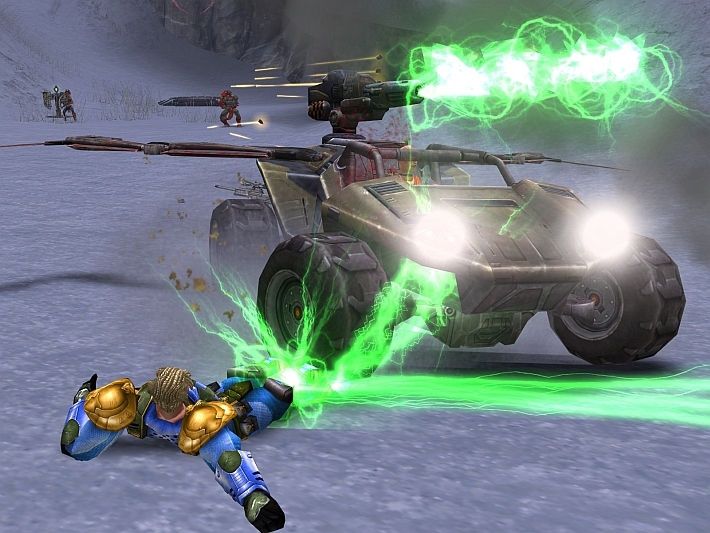 While Unreal Tournament 3 is the latest in the franchise, The more colourful 2004 edition remains a fan-favourite despite its age. UT2004 should install on a modern PC without any issues. To install from the retail DVD version, simply put your game DVD into your computers optical drive and follow all on-screen prompts. If the games autorun prompt does not appear, browse to the DVD in Computer/This PC and run the Setup.exe file manually. 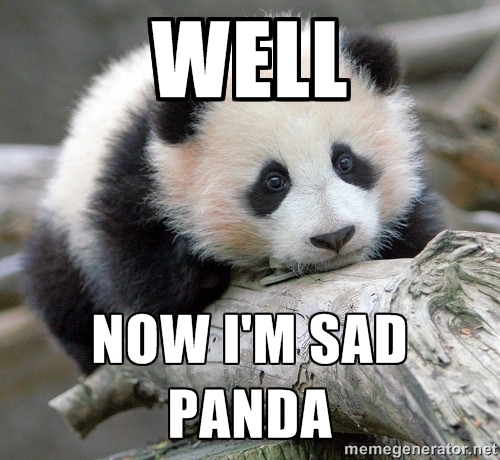 There were several patches released for the game, with the last one being patch 3369. Before you play you should make sure that this patch is installed. If you bought the game from GoG or Steam, the patch should be installed already. For the retail CD version, you should install the UT2004 Mega Bonus Pack, which includes the patch and a nice selection of bonus content (including content released in the Editors Choice Edition upgrade). Once you’ve downloaded this pack, simply double click on it and follow the on-screen prompts and it will install automatically. If you’re playing UT2004 on a Windows 10 machine you may find that your game crashes back to the desktop when you start it. There will be a cryptic error about “LockRect failed: D3DERR_DEVICELOST”. To fix this problem, we need to edit some configuration files. If you’re not familiar with this process, see this tutorial. First of all, browse to the System sub-folder within your UT2004 game folder (by default, that’s under C:\UT2004, or C:\GoG Games\UT2004 for the GoG version). Locate a file called “UT2004.ini” and open it in Notepad or your favourite text editor. If you can’t find this file, make sure you have tried to launch the game at least once. Once you have the ini file open, find the line that reads “ReduceMouseLag=True” and replace it with “ReduceMouseLag=False” (do not copy the quotation marks). Save the file and then exit your text editor. You should now be able to launch UT2004 on your new Windows 10 PC no problem. Before you load up your rocket launcher, you should take some time to tweak the games visual quality settings. 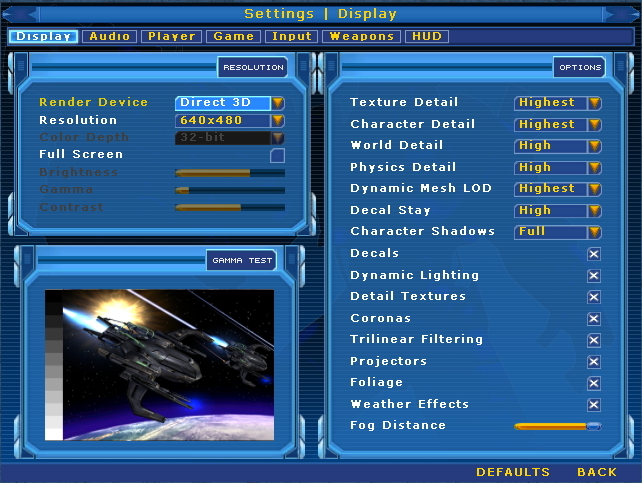 Launch UT2004 and from the main menu, choose “Settings”. Then, from the options at the top of the screen, choose “Display”. You should then see the options shown below. Resolution – Set this to whatever resolution your monitor supports. Note that you can only select 4:3 (none widescreen) resolutions here. We will show you how to set widescreen modes later. Full Screen – Typically you will want this ON for the most immersive experience. Brightness, Gamma and Contrast – Set these to taste. Not too bright else you will lose detail in the brightest part of the image. All other settings – Generally you can set these on High, Highest or Full for most modern PCs, certainly for any gaming PC. The game will say a naughty word if you do this, as if in shock, but most modern PCs can cope. If you find the game is running slow, go back to the defaults and turn the settings up more gradually until you find a balance between quality and performance. Setting widescreen resolutions – In order to play the game in widescreen mode, we’ll need to do some manual editing of a couple of ini files. If you’re not familiar with editing text/configuration files, see this tutorial. Be careful to only edit these files as instructed. First of all, open up a File Explorer/Windows Explorer window and browse to your UT2004 game folder. By default, that’s under C:\UT2004, or C:\GoG Games\UT2004 for the GoG version. Open the “System” sub-folder and find the file called “UT2004.ini”. Open this in Notepad or your favourite editor. Now, find the line FullscreenViewportX= and change the value after the X to match your monitors horizontal resolution. For 1080p monitors/TVs, use “FullscreenViewportX=1920”. For 720p displays it’s “FullscreenViewportX=1280” (do not copy the quotation marks). Next, find the line “FullscreenViewportY”, which should be directly below and change this to match your monitors vertical resolution. For 1080p monitors/TVs, use “FullscreenViewportY=1080”. For 720p displays it’s “FullscreenViewportY=720” (do not copy the quotation marks). Save the file once you have done editing it. Now, find the file user.ini and again, open this in Notepad or your favourite editor. Find the lines “DesiredFOV=90.000000” and “DefaultFOV=90.000000”. Change the value of both of these lines to “105.000000” (do not copy the quotation marks). The WSGF site recommends 105.000000 for 16:9 resolutions (such as 1080p and 720p) or 100 for 16:10 resolutions (such as 1920 x 1200). Save the file when you are done working with it and you’re now finished configuring the game for widescreen. During play you will find that HUD elements and menus are stretched, but the games 3D visuals etc will work perfectly fine. Remember that if you change screen resolution in-game, you will have to go back and re-edit the UT2004.ini file again. To change sound options, choose “Settings” from the games main menu and then choose “Audio” from the options at the top. There aren’t so many options to configure here, but pay attention to the “Audio Mode” setting. 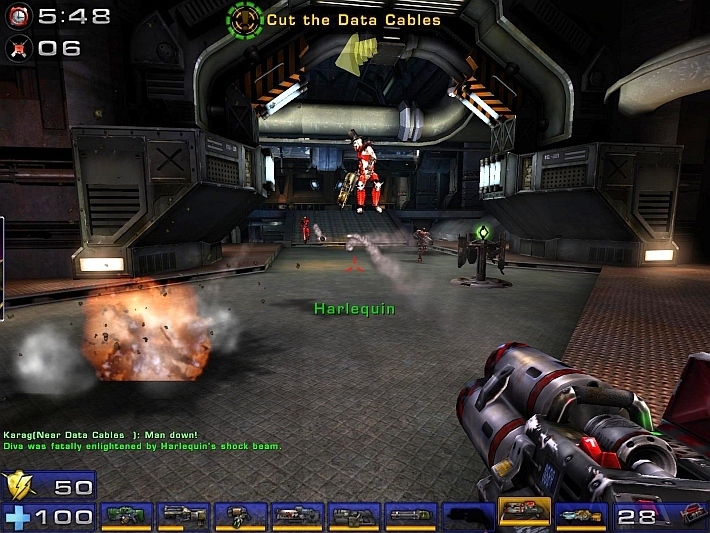 Like many older games, UT2004 supported hardware accelerated audio and special effects for users who had suitable Creative Audio sound cards. The “H/W 3D Audio” and “H/W 3D Audio + EAX” options won’t normally work on Windows Vista and later, but if you have Creative ALchemy or similar software, you can use this software to restore full hardware audio capabilities to the game. When using ALchemy, you should install it to the System sub folder within your UT2004 game folder. UT2004’s audio engine is based on OpenAL which should work well on modern PCs, even without ALchemy or Directsound availability. UT2004 is all about the multiplayer. Fortunately, even despite its age, the multiplayer functions still work perfectly. 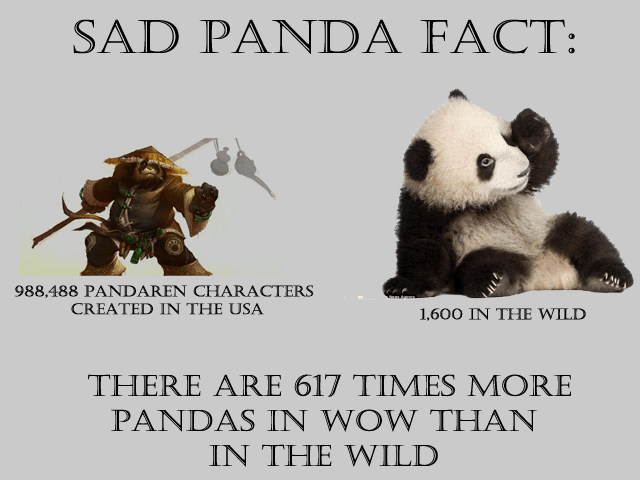 Not only that, but most times of day there are a number of players online to play against too. To play multiplayer, simply choose “Join Game” from the main menu. If you get an error message about the Windows Firewall blocking the game when you try to connect to multiplayer, see the troubleshooting notes. At this point you should see several options including “LAN” (play on your home network) and “Internet”. Click on “Internet” and then choose a game type from the drop-down box. Look for a server with some players online and click on it to connect. You can also play this game on your home network (LAN). Pick up a couple of copies cheaply from GoG.com and grab a few older PCs and throw yourself a little LAN party, it’s awesome fun! One computer needs to be the host, this should be the most powerful PC, while the other computers connect as guests. On the main menu click on “Host Game” to host your game, then the other computers simply need to click on “Join Game” and select “LAN”. You can host your own games over the internet too, though you may need some networking know-how to open/forward ports on your router. Alternatively you can just arrange to meet on one of the many public UT2004 servers. 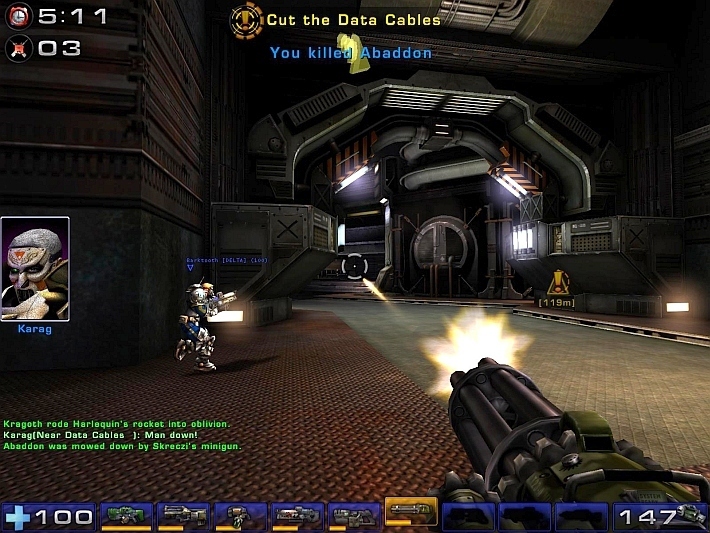 The fantastic gaming utility/in game overlay Evolve supports Unreal Tournament 2004. This tool lets you contact your friends, set up parties and organise matches, as well as take screenshots, videos and access the web all without having to keep switching back to the desktop. The GoG.com version of the game is set to run as administrator each time it is launched, but this is not necessary (or recommended). UT2004 has a huge amount of user created content available for it. Typically if you connect to a server that has content that your local PC lacks it will download automatically. Crosshairs/aiming is jittery – If aiming in the game feels jittery, especially when trying to line up a precise shot, it’s probably due to mouse smoothing. You can turn this off by editing the user.ini configuration file. First of all, browse to the System sub-folder within your UT2004 game folder (by default, that’s under C:\UT2004, or C:\GoG Games\UT2004 for the GoG version). Locate a file called “user.ini” and open it in Notepad or your favourite text editor. look for the section beginning [Engine.PlayerInput]. Firstly, find the line that says MouseSmoothingMode and change it to MouseSmoothingMode=0. Then, find the line that begins MouseSmoothingStrength and change it to MouseSmoothingStrength=0.000000. Save the file when you’re done editing it, that should make aiming in the game a lot more precise, especially with modern high DPI gaming mice. Save the file once you have edited it and start the game again, you should now be able to connect and play online. Nothing mini about that gun. fast paced combat on foot or in vehicles. Yes there are tanks too. What error did you get? I ran UT2004 a few days ago on Windows 10 and had no problems. I went from windows 7 to 10 and after installing the game I wound up with 2 problems. I lost the zoom feature for the scope and the transporter does not work properly at all. Any help for these two problems.